Above: Virginia was still ruled by a king when a young boy lived here, who would one day reshape the form of government. 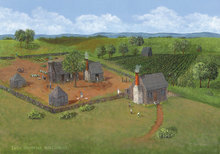 Mount Pleasant is shown in an artist’s rendering with its kitchen and slave quarters. - Courtesy of the Montpelier Foundation/Linda Boudreaux Montgomery. The story of Montpelier began when Ambrose Madison (ca. 1696–1732) decided to strike out west on the new frontier. He had no way of knowing that his grandson, James Madison, would on that very land cultivate revolutionary ideas that would shape a new nation. After the Madisons moved to their new house in the 1760s, the Mount Pleasant kitchen became a quarter for an enslaved family. It was accidentally burned some 30 years later. Archaeologists found many of the enslaved family’s household possessions in the buried rubble. Ambrose was a planter, slaveholder, and prominent member of society in King and Queen County in the Tidewater region of Britain’s Virginia colony. When in 1723 he received a patent for 4,675 acres in the largely untouched Piedmont region, he sent a group of slaves and an overseer to begin clearing the land and planting tobacco. This early connection between slaves and the land would set the tone for our nation’s most distressing paradox—how could we have built our nation on liberty for all when enslaved human beings were doing the building? Nine years later, Ambrose and his wife, Frances Taylor Madison, arrived with their three children. The family called the plantation Mount Pleasant. Shortly thereafter, Ambrose died under mysterious circumstances. Three slaves, Dido, Turk, and Pompey, were found guilty of poisoning the patriarch, although speculation remains to this day as to whether or not the enslaved defendants were used as scapegoats. Frances Madison, then only 32, inherited the tobacco plantation and its 29 slaves and ran it successfully until her death in 1761. When her oldest son, James (father of President Madison), came of age in 1741, he worked alongside his mother to diversify the operation, adding a number of new crops and establishing a large blacksmith shop, a brandy distillery, and a store to sell goods to neighbors. Impressive yellow poplars, oaks, tulip trees, hickories, and ash trees populate the 200-acre Landmark Forest. The forest is located on a band of rich Davidson loam soil, enabling the trees to grow to remarkable size in the centuries since Madison’s father and grandfather cultivated the land. In 1749, James, Sr. married Nelly Conway and brought her from Port Conway on the Rappahannock River to the still largely untamed Piedmont. Two years later, they welcomed their first child, James Madison, Jr., a man whose ideas would shape a nation not yet born. Just as Montpelier was the birthplace of so much revolutionary thought, so is it a place where we can explore how those ideas impact our lives in the present. Madison advised, “No studies seem so well calculated to give a proper expansion to the mind as Geography & history.” Although he never traveled abroad, Madison’s ideas on constitutional self-government would eventually have impact across the globe. From childhood, James Madison showed an insatiable thirst for knowledge. Initially taught at home, likely by his mother, he left Montpelier at age 11 to study at the highly respected school of Donald Robertson in King and Queen County. Madison was a 32-year-old delegate to the Continental Congress, applying his classical education to solving the problems of a new nation. 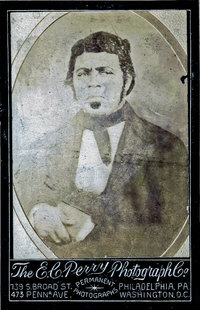 Robertson, who hailed from Scotland, had made a name for himself teaching the sons of Southern planters. Under his guidance, Madison embraced mathematics, geography, and languages, both ancient and modern. His skill in the former established an early foundation in classical philosophy that would, along with the ideas of modern Enlightenment thinkers, steer his worldview. Madison would go on to the College of New Jersey (now Princeton University) and become known there for his devotion to his studies. Latin, Greek, natural philosophy (science), geography, mathematics, rhetoric, philosophy, speech, and debate—Madison excelled all around, and became Princeton’s first graduate student, tackling Hebrew, political philosophy, and even a little law. As a boy, Madison eagerly read British essayist Joseph Addison’s The Spectator, which he later wrote gave him “a desire of improvement, a taste for Learning, and a lively sense of the duties, the virtues, and the proprieties of life.” The adult Madison was an avid reader of newspapers such as this American one also named The Spectator. While Madison’s drive to learn set the tone for the rest of his life, it is important to remember that his race, gender, and class enabled him to dive deeply into classical and Enlightenment thought and spend so much time developing his own ideas. A white, male, Southern planter had the means, the social status, and the leisure time to devote to studies. James Madison, letter to George Thompson, 30 June 1825, James Madison Papers, Library of Congress, Washington, D.C.
As 21st-century Americans, we know our rights and we expect our government to protect them. Before Madison’s day, this way of thinking was virtually unknown. In the 18th century, caste systems based on power in the hands of a privileged few were too entrenched, too organized, and most of all, too self-perpetuating to be disassembled. 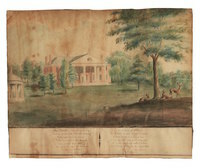 The Madisons’ friend Anna Maria Thornton wrote that Montpelier was “susceptible of great improvements” after visiting in 1802. She painted Montpelier with these future “improvements” – a Temple, a central front door, and a three-part window on the second floor – which the Madisons would add a decade later. James Madison turned the status quo on its head. He and his peers envisioned a new nation with a limited government that served the people equally, but it was Madison who created the framework for making it work. The social contract described by the Declaration of Independence, in which the people hold the government accountable and the law applies to all citizens equally, was a lofty goal until the Constitution prescribed a system of government that could be kept in check on all fronts. With the core ideas of the Constitution, the Federalist Papers, and the Bill of Rights, Madison set a standard for the entire world. This framework for the American Experiment would resonate across centuries, giving millions of other oppressed people across the globe the basis they needed to claim their own liberty. All men having power ought to be mistrusted to a certain degree. Madison first showed his commitment to individual liberty in the early years of the Revolutionary War, supporting Baptist ministers who had been jailed for their preaching. When the Virginia legislature drafted a Declaration of Rights in 1775, Madison proposed a small rewording with far-reaching consequences. Rather than supporting religious “toleration,” which implied that the state-supported church would merely tolerate the existence of other sects, Madison persuaded the legislature to revise the document in favor of “the full and free exercise of [religion], according to the dictates of Conscience.” Madison would represent Virginia in the original Confederation Congress, then the U.S. House of Representatives, then as Secretary of State under Thomas Jefferson before becoming president himself in 1809. In the winter of 1786, Thomas Jefferson sent Madison two trunk-loads of books that Madison wrote were “perfectly to my mind.” Some of these books may have helped Madison when he studied historical examples of the republican form of government in preparation for the Constitutional Convention. Of course, these radical ideas about the power of the citizenry were contradicted by their own limitations on who had the right to citizenship. Women, Native Americans, enslaved people, and free people of color were kept in their own spheres, without the same rights as white males. This would change only very slowly over the course of many years. James Madison and the rest of the Founding Generation were under no illusions that future Americans would have the same needs or pressing issues as those in 1776. 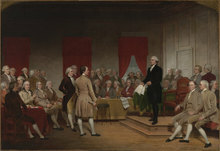 The Constitution therefore included the means to make amendments so that, Madison personally hoped, the document would grow to include the rights of an increasingly diverse society. James Madison, Federalist No. 51, February 6, 1788. Madison’s star wouldn’t have risen as far as it did without the partnership of his wife, Dolley Payne Todd. A natural diplomat, brilliant social connector, and affectionate companion, Dolley skillfully maneuvered in Madison’s circles to create an atmosphere in which measured, productive conversation thrived. She knew that people with conflicting viewpoints and opinions could come together peaceably in a drawing room or around a dinner table, and her gift for making every individual feel welcome and important made her invitations particularly sought after. Just as Dolley was crucial in helping Madison’s groundbreaking ideas reach the right ears, she was equally responsible for establishing a protocol at the White House that reflected the new republic’s ideals. Gone were the stiff, formal gatherings of Washington’s and Adams’s presidencies, and gone were the overly casual, male-only dinners of Jefferson’s—Dolley created a happy medium. Her White House was one of elegance and taste, but it also embraced hospitality with a spirit of openness and community that would have been unheard of under a monarchy. This would become the American standard, not just for First Ladies but for households all over the nation. Joseph Dennie, “Mrs. Madison,” The Port Folio, February 1818. Dolley lore abounds, including the true story of her order to save a Gilbert Stuart portrait of George Washington before the British burned the White House in the War of 1812. But less well known are her deep attachment to a troubled and troublesome son, her opinions on slavery, and her struggle with debt after Madison’s death in 1836. Money problems plagued Dolley as Montpelier continued to be unprofitable, and as John Payne Todd, her son from her first marriage, accumulated massive gambling debts. Despite Madison’s wish that she not sell slaves without their consent, she sold Montpelier’s enslaved men, women, and children as she needed to, apparently without regard for keeping families together. Although Dolley’s Quaker father had freed his slaves when Dolley was fifteen, Dolley herself was no abolitionist. 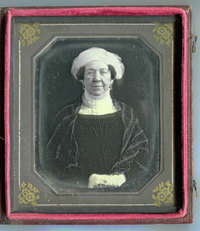 Dolley’s public persona was much more sympathetic. Not only did she take an active interest in the people-run government that her husband proposed, she did everything in her power to help him achieve it. And her power, it turned out, was considerable. Even though the patriarchal society of the 18th century typically allowed white women agency only in the domestic sphere, Dolley Madison functioned there as an essential political partner. Tea, coffee, wine, cake, and ice cream sweetened politicians’ dispositions during Dolley’s Wednesday evening entertainments at the White House. The Madisons’ original silver tea and coffee service now is now in display in the Montpelier dining room, a legacy of Dolley’s hospitality. The setting sun lingers on the periwinkle-covered graves of 40 or more members of the enslaved community. The graves are unmarked but for a few simple fieldstones, and sadly, the identities of the dead are lost to history. While James Madison and other founders were honing their vision for a new republic, thousands of enslaved people labored on Southern plantations, producing their cash crops, running their households, cooking their food, and raising their children. It’s the great American disconnect—a country founded on principles of liberty and equality…yet founded on the backs of human property. Madison was keenly aware of this contradiction. He spoke multiple times against the institution, and his correspondence indicates a deep internal conflict. His peers fell in different camps: some interpreted the Declaration of Independence to mean that every human being was entitled to the same rights and pushed for immediate abolition, some advocated for gradual emancipation, and others justified slavery as not only necessary for economic security, but also as reflective of a natural hierarchy of the races. Madison didn’t believe that white Americans would accept free African Americans living among them—he also worried about Dolley’s security upon his death. Despite his personal distaste for slavery, Madison chose to leave Montpelier’s enslaved men, women, and children to Dolley in his will instead of freeing them. She, in turn, sold many of them over the next several decades, in contradiction to his wish that she not sell them without their consent. The remaining few were bequeathed to her son, Payne Todd, whose will freed them upon his death, but whose debts likely meant that few, if any, were able to become freed. Descendants of Montpelier’s enslaved community are actively involved in Montpelier’s ongoing research efforts, including family history and archaeology. During excavations in the South Yard, descendant Leontyne Peck unearthed artifacts that could have been touched by her ancestors. 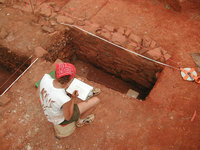 Archaeology provides the best means to understand the material lives of enslaved people. Since 2000, Montpelier’s archaeologists have located and analyzed the remains of homes, workplaces, and household and personal possessions to piece together information on how the plantation’s enslaved community lived. 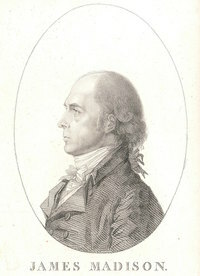 Thanks to surviving written documents: letters, plantation records, and one remarkable memoir, we know the names of close to 300 individuals, among them Paul Jennings, Madison’s manservant; Sukey, Dolley’s lady’s maid; and Billey, who accompanied Madison to Philadelphia and was exposed to too many ideas about freedom to deem him safe in Madison’s eyes to return to Virginia and associate with the plantation slaves. The evil of slavery wasn’t confined to mistreatment or even loss of liberty. It was the attempt to deny men, women, and children their basic humanity that resonates to this very day—and is the root of many current issues confronting our nation. At Montpelier, it’s challenging to understand the complete story of the people whose names appear only briefly in the written record. We look for any clues about who these individuals were, what they believed, how they lived, and even who their descendants are today. Slavery has deprived and will continue to deprive entire generations of answers about their past. While the combined use of written records, surviving objects, and archaeology help us construct the story of the Madisons, what’s below ground can give us the most insight into how black Montpelier residents lived their lives. The property’s evolution from plantation to 20th-century horse farm to historic landmark kept layers of artifacts essentially undisturbed. From the time Dolley Madison sold Montpelier in 1844, the artifact-rich parts of the grounds were never plowed or developed, turning today’s Montpelier into an archaeological treasure trove. Archaeology is a painstaking process but a highly effective means of studying the past. The smallest shards of pottery or glass, a button, or a fragment of a tool can tell us so much about who lived and worked on a specific piece of land. Each excavated artifact is tagged with the precise location where it was found. When concentrations of artifacts are found in a single location, or when artifacts from different sites are matched together, archaeologists can draw conclusions about what happened in each place. For instance, the discovery in 2015 and 2016 of three pieces of a decorated pipe bowl made out of white clay gave us a glimpse into the life of at least one individual, probably enslaved. A pipe was a common object in the 18th and 19th centuries, and this one’s markings celebrate pride in the young nation. It features Lady Liberty’s profile, encircled by stars, with the word LIBERTY across her brow. All three pieces were discovered in the South Yard, presumably owned by one of the same enslaved people who served the Madisons and guests at their dining table, an unconsidered audience of the day’s great thinkers as they discussed the certain and inalienable rights of man. This pipe shows that the concept of liberty was valued by its owner, and it’s another representation of the paradoxical overlay of progressive thought over top an institution built on hierarchy of race. Montpelier staff, volunteers, field school students, and Expedition participants work year-round in the lab, washing, sorting, mending, and cataloging artifacts. Their painstaking work leads to new insights into the past. Since 2000, descendants of those who lived in slavery at Montpelier have been a major part of the effort to bring the stories of their ancestors into the present day, providing genealogical and family information, advising on ways of presenting their stories, and sifting through the soil with their own hands to forge connections with past generations. Just as learning about Madison’s ideas can help us understand the present, seeing and holding buttons, nails, hardware, glass, pottery, needles, pins, and many more kinds of artifacts gives visitors the chance to help us discover the past. Visitors from all over the world come to Montpelier to learn how James Madison's ideas shaped our nation. Montpelier isn’t just the home of James and Dolley Madison, or even the 300 enslaved African Americans who lived and worked on the estate over the years. It’s the place where the revolutionary ideas that shaped our nation were planted and cultivated so that future generations could harvest them. And it’s also a place where those ideas can continue to evolve. The Young African Leaders Initiative is an investment in the next generation of leaders in Africa. As part of an intensive six-week program, 25 men and women from several African countries spend a week at James Madison’s Montpelier, returning home with the constitutional tools to build a strong civil society. Lawyers, judges, civil servants, students, and many others come to Montpelier to study the principles that changed the world at the Robert H. Smith Center for the Constitution. Here, people get together to participate in civic dialogue, gain a more thorough understanding of America’s founding ideals, and learn how to take a more active role in our democracy. The James Madison Landmark Forest is a living symbol of how enduring Madison’s vision truly was. The old-growth stands of oak, poplar, and beech have been virtually undisturbed since Madison’s day, and the extremely fertile soil of the region has helped them grow to soaring heights. Montpelier’s eight-plus miles of nature trails let visitors appreciate the estate’s natural history in addition to its philosophical one. The end of slavery is not the end of the story. Students gain a new understanding of Jim Crow laws during a tour of the 1901 Montpelier train depot, where doors labeled “White” and “Colored” lead to segregated waiting rooms. James Madison felt that a government run by the people must, in order to succeed, be understood by its people. Citizens of a republic, he believed, have a responsibility to learn not just the “why” but the “how” their government operates. And that knowledge, in turn, will act as another check upon a central government. At Montpelier, we not only celebrate Madison’s foresight, we actively apply his world-changing ideas to contemporary life. Just like he would have wanted us to. Come and join the conversation at Montpelier.